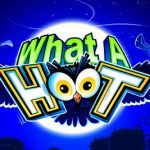 What A Hoot is quite unusual video slot game. We have seen many animal themed slots but we are not quite sure that we have seen one before that is about owls. This makes this slot quite unique and it is good to come across something new from time to time. Lately all the slots are revolving around the same old tested themes. This is such a creative marvel and we love it. We have 2D symbols placed on blue background. They are all beautifully designed and cheerful, we must say. 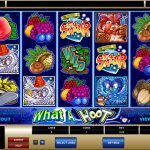 What A Hoot is a very simple slot. It is played on 5 reels and 9 pay lines with no special features at all. But after all that is the true beauty of this slot. Finally we have a game where we do not get distracted by many complex special features. There is no waiting for the third scatter that never comes, there are no leveled bonus games that often times we do not get the chance to play. There are only 2 special symbols, like in many games of this caliber, the wild and the scatter. The wild is a pair of eyes lurking from a tree in the dark and its function is to complete a winning combination by standing in for every other symbol except the scatter. Then we have the open jar acting as a scatter and offering scatter payouts. 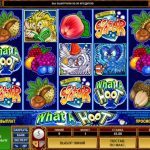 What A Hoot turns out to be an excellent video slot game from Microgamnig. We are not surprised, since this provider has some of the best games ever. This slot offers a very relaxing game play where you need to spin the reels only and with no distracting special features. For a bit of nostalgia and fun try playing Vinyl Countdown a 5 reel slot by MicroGaming.